We have a library book at home at the moment, which Lulu and I read quite often. A pointing book where the kid has to find various items. It's originally German, translated into a Danish version. Komm mit uns durchs Jahr by Annette Fienieg, 2008. We've read it about 50 times and Lulu loves it. I say "show me the bird/ball/umbrella" and she points. There's bicycles in the book, too, and Lulu's particuarly good at finding them. 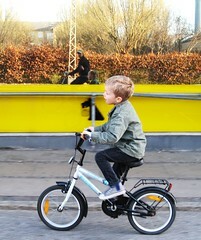 Not because her dad has a couple of bicycle culture blogs, just because she's a Danish kid. She sits on a cargo bike on her way to daycare each day and from her perch she is presented with a constant parade of human-powered movement. Not bad marketing at all from such an early age. In her current, albeit rapidly-expanding world view, bicycles are all around. So much so that they don't register. They just are. If we lived in the woods, she wouldn't really think trees were strange. Her dad's certainly not a bike geek, so she doesn't see bicycles in the flat or see her dad oiling, adjusting, polishing bicycles in the back yard. She does hear "come on, Lulu, time to get into the bike..." or "we have to go... you can finish your banana on the bike". And other everyday references to our most used transport form. She shares the cargo bike with her big brother - her role model in many ways - and she sees him riding alongside. We don't talk about bicycles, we just use them. She just sees bicycles and people moving about on them every time she steps out of the door into our city. Soon she'll be joining their ranks on her own bicycle. Quite nice that. A new instrument piping into the organic bicycle symphony that is Copenhagen. 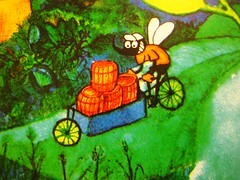 I've posted about Egon The Cycling Mosquito earlier. At right is another book I grabbed from the bookshelf in my boy's room to illustrate other good examples of marketing the bicycle postively. 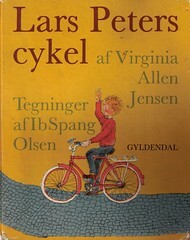 The list of books for children featuring the bicycle in a leading role is long. I'll get around to blogging about them in the future. I think it's brilliant that the bicycle features in so many Danish and European books as a normal feature on the urban landscape. 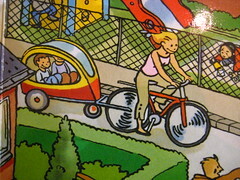 Literature, even childrens' literature, reflects society in many ways, so it's natural that bicycle books for kids abound. 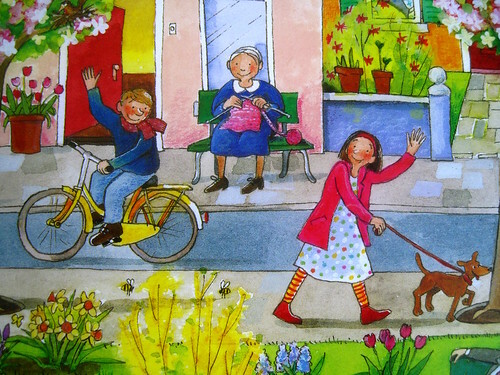 It is, however, very important to keep portraying the bicycle as normal in literature and TV for children. We're battling car-centricism even here in Denmark so positive marketing of the bicycle must be continued now more than ever. Not only for continue to strengthening our bicycle culture, but also as a symbol of enivironmental responsibility. Something that is and will be so much more important in my childrens' lives than it was in my childhood. Not to mention fighting the Culture of Fear and the frightening, negative societal consquences that it entails. There is a show on Cartoon Network - don't know the name - that my son watches and the cast of characters includes a kid whose parents are quite afraid of... well... everything. Their entire home is fitted out with padding and then force the kid to wear the full range of safety gear... constantly. Needless to say these parents are frightfully uncool and ridiculed. A small step towards fighting The Culture of Fear, served with humour and irony.